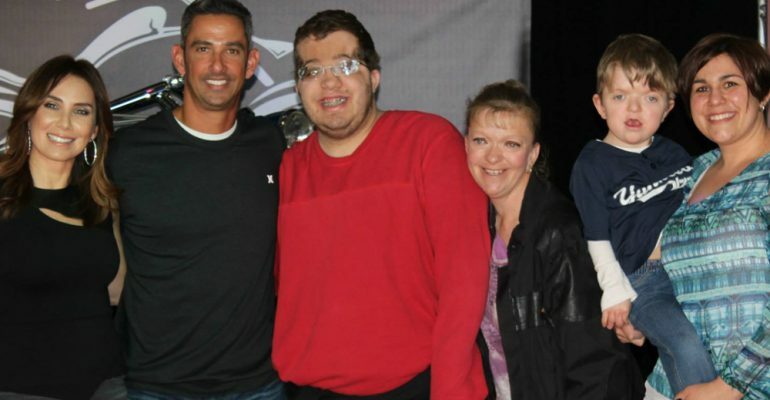 NEWBURGH — A few hundred Yankees fans gathered at Orange County Choppers on Sunday to wait for an autograph and handshake from Jorge Posada. They brought bats and balls and posters. And it was all for a good cause. Posada was joined by his wife, Laura, and children, Paulina and Jorge Jr. They sat in front of the Yankees motorcycle featured on the Orange County Choppers television show years ago. Proceeds from the event went to myFace, a charity organization formerly known as the National Foundation for Facial Reconstruction. Jorge Jr., 15, suffered from craniosynostosis, a condition affecting the growth of the skull in infants. He underwent numerous surgeries over the years, but has started playing baseball in Miami, where the Posadas reside. Sean Schulich, a Woodstock native, is myFace’s Director of Development. He was thrilled to be a part of the festivities and glad to have the opportunity to spread his message among the Yankees fans in attendance.